Order fresh roses quickly and simply. Guaranteed services and best quality are brought to you by GolGift. Send gifts in just three simple steps. Track the preparation and the delivery. First step: You browse the products and select your desired gift. Second step: You enter the receiver’s information, time of delivery, etc. You can also add a free customized postal card to your order. Last step: You purchase your order through Paypal or Shetab gateways. After completing these step, you will be notified about the preparation and delivery of your gift. Say hello to GolGoft and it's amazing Features. 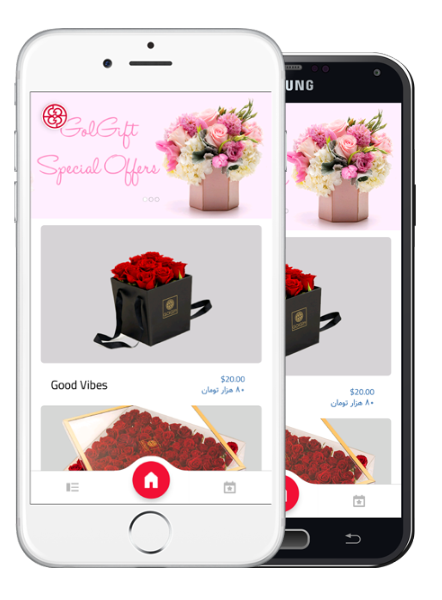 Let's explore GolGift application and its features.